Discover the original international diet sensation—used by Adele, heavyweight champion David Haye, and Pippa Middleton—that will help you lose seven pounds in seven days while experiencing lasting energy and eating all the foods you love. Over the past few years, fasting has become a popular diet option. Studies show that fasting—whether through moderate calorie restriction every day or the more severe but less frequent intermittent fasting—can help people lose about thirteen to fourteen pounds in six months and reduce their risk of developing disease. When we fast, our body’s energy stores activate what is known as sirtuins, or the “skinny gene,” and many positive changes ensue. Fat storage is switched off, and our body stops its normal growth processes and goes into “survival” mode. Fat burning is stimulated and the genes involved in the repair and rejuvenation of our cells are turned on—which all results to weight loss and improved resistance to disease. But if not done correctly, fasting can lead to hunger, irritability, fatigue, and loss of muscle. Enter Sirtfoods: a newly discovered group of foods that is revolutionizing healthy eating. Ranging from chocolate and red wine to garlic and walnuts, sirtfoods are particularly rich in special nutrients that help us activate the same skinny genes in our bodies that fasting triggers. 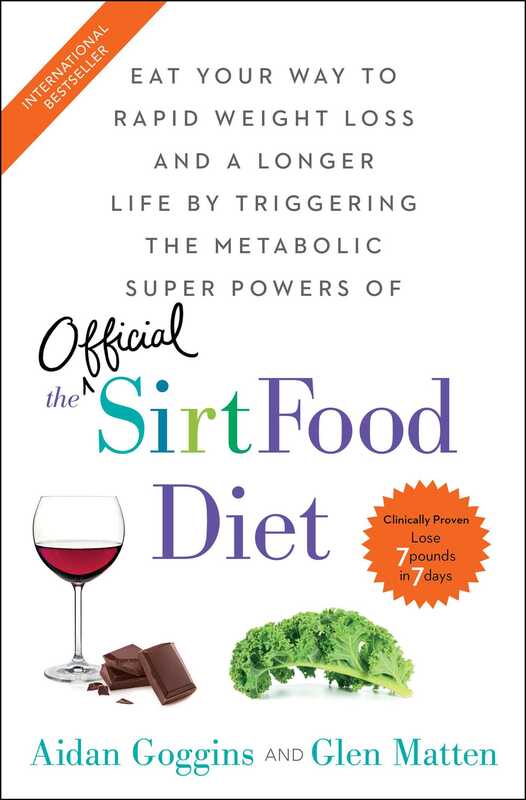 Nutritionists Aidan Goggins and Glen Matten have created The Sirtfood Diet to help you effectively lose weight and improve your resistance to disease, while still giving you incredible energy and glowing health. Adian Goggins (BPharm, MSc Nutr Med) became a pharmacist and nutritionist driven by his own quest to cure his rare autoimmune disease. He is one of Europe’s leading health experts. Unparalleled in his nutrition approach, Aidan is highly sought after, with clients spanning from leading medical doctors to celebrity TV personalities. He specializes in sports nutrition, and his dietary expertise underpins his success of many of the world’s best athletes. He is a prominent media health pundit and an award-winning and bestselling author. He is the coauthor of The Sirtfood Diet. Glen Matten (MSc NutrMed, DipION) is the author of the award-winning book The Health Delusion and the coauthor of The Sirtfood Diet. With a degree in nutritional medicine, he has made frequent forays into the media spanning TV, radio, and numerous national magazines and newspapers. With an approach deeply rooted in nutritional science, Glen has run successful clinics across the UK for over a decade. He collaborates closely with medical doctors, attracts clients from all over the world, and works with a number of professional athletes and celebrities.